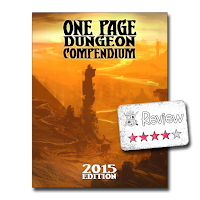 This week I've decided to pick up a PDF copy of the One Page Dungeon Compendium, 2015 Edition. DriveThruRPG has all of the One Page Dungeon compendiums going back to 2013, and the best deal...assuming you don't already have them, is probably the printed copy bundle of 2013-2016 for $40. I picked up 2015's Compendium thinking it was the latest, but there is a 2016 available.....it just didn't show up in my "search". Ninety-five one page dungeons in a 40 MB, $3 PDF...sounds like a winner to me. The PDF is not secured or watermarked, which is fairly important because some of the dungeons take up every bit of space they can on the page. Just flipping through the pages on something like this is a lot of fun and well-worth the price of admission. Because these "dungeons" were developed by different people with vastly different skill levels and ability, the resulting collection comes across as severely disjointed and a bit bizarre...because it is. There is a dungeon developed by a nine year old and some from professionals. Quite a few entries are black & white while others use a wide array of colors. The dungeons are all over the place and even if you choose not to use a single dungeon, just the diversity of ideas makes this product a must-by in my opinion. While I purchased the PDF for $3, I'm almost wishing I had picked up the print edition for only $12, but since the value for me is more along the lines of idea generation, having the printed copy is more so I can devote more screen real estate to something else. Of course I could just print up an individual page if need be. The biggest problem I have with the One Page Dungeon Compendium, 2015 Edition is that some of the dungeons are really difficult to work with. The Star Pit on page 66 is a great example. Awesome idea of cutting the map out and rolling around a cylinder, but the text is nigh unreadable. This was the only dungeon I couldn't read, but some of the others were difficult. At least with the PDF I can zoom in enough to read difficult text. I've also noticed that every page is basically one big picture, which means that when you do zoom in the text can become pixelated. Not really much you can do about this since these are creations from multiple authors. Not everyone is going to be able to send their entries as InDesign files. Overall though I really love this PDF and while I'm kind of thinking I want this in print, I'd still want the PDF so I could print off individual pages. Several dungeons ask you to cut a section of the page out and you really cannot do that with the printed version because you'd be destroying the dungeon on the back side of the page. I wish that the print versions also came with a PDF because then you'd get a more usable copy if you really wanted to use these dungeons at your table. Still......$3 for a large group of ideas is nothing to sneeze at!